• Single line embosing code available. 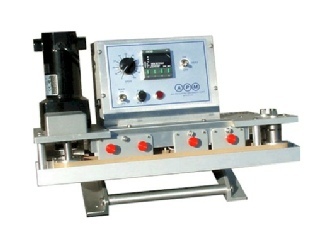 Portable USDA approved rotary table model sealing system 3/8" wide hermetic seal without a trim. Designed on swivel base for sealing from vertical to 45 degrees position. 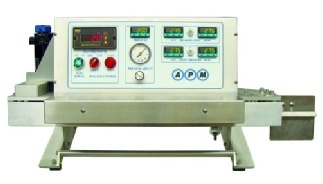 Tabletop hi speed validatable rotary band sealer. Unit is designed with 10" long heating zone, and 10" long cooling zone for greater flexibility in product sealing of difficult materials with temperatures up to 450 degrees +/-2 degrees Fahrenheit.